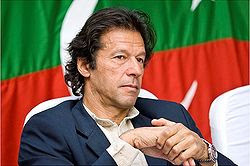 Chairman of Pakistan Tehreek Insaf (PTI) Imran Khan announced to do Sit-In (Dharna) against US Drone Strikes in Pakistani Tribal Areas on 23rd and 24th April 2011 on path of Nato Supplies near Peshawar that goes from Pakistan to Afghanistan. As 23rd April has came close the arrangements for Sit-In (Dharna) are almost finalized by PTI. People from different parts of Pakistani specially youth will be taking part in this Sit-In that will continue for two days. Political Workers of other Political Parties like Jamat Islami, Q League will also be taking part in the Sit-In. The Main Purpose of this Sit-In is to register protest against US Drone Strikes in Pakistan which has killed over a thousand Civilians in last one year.